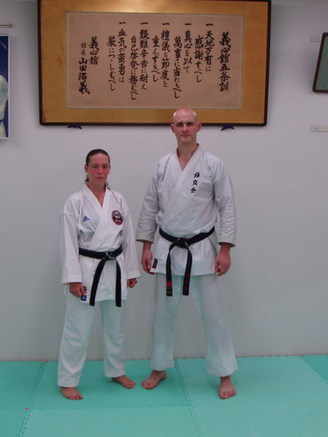 Instructors Roland Clark 4th Dan and Adele Gill 3rd Dan have over 25 years of experience, are CRB checked, insured and hold first aid certificates. We aim to provide safe, enjoyable training in Karate, for anyone from 7 to 70, from beginner to black belt and beyond. People train in karate for many different reasons and we can provide training for you whether you just want to keep fit, learn self defence or compete in tournaments. Shukokai (pronounced shu-ko-kai and meaning group that trains together) is a style of Karate introduced to the UK in 1968 by Japanese instructors Sensei Tani (1921-1998) and Sensei Kimura (1941-1995). Sensei Tani had trained under Chojun Miyagi (Goju ryu) and then Kenwa Mabuni (founder of Shito-ryu). After the war Sensei Tani began teaching in an open air car park in Kobe, Japan and his group (Shukokai) grew. Soon he built a dojo (training hall) at his house. In 1946 Sensei Mabuni gave permission for Tani to form his own style of karate, Tani-ha shito-ryu.